Eggs, Chickens & Turkeys, oh my! SpringMore Farm eggs have beautiful orange yolks that are a result of the hens' healthy grass-fed diet! Once you try these eggs you won't go back to store bought. Our flock is made up of Rhode Island Reds, Plymouth Barred Rocks, and Black Australorpes. We also have a few Araucanas that lay green eggs! We raise Freedom Ranger meat birds April until October. They are raised in floor-less, portable pens that we call "chicken mobiles". We move these twice each day so the chickens always have access to fresh grass, insects, and worms. We also offer a weekly Poultry CSA so you can enjoy fresh chicken all Summer and Fall! 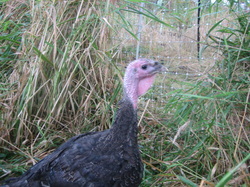 Our Turkeys are also on pasture and love to eat crickets and grasshoppers. We dedicate a row in the garden for their ultimate favorite, Winter Bor Kale. Place your holiday order early because our turkeys always sell out quickly.